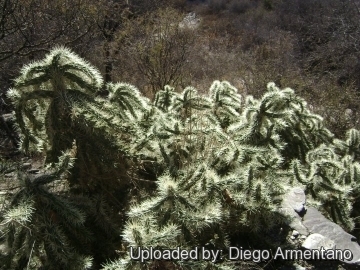 Origin and Habitat: Chihuahuan Desert, probably in Texas, throughout northern Mexico (Coahuila, Guanajuato, Hidalgo, Jalisco, Nuevo León, Puebla, San Luis Potosí, Tamaulipas, and Zacatecas), also widely distributed in Colombia, Chile and Ecuador though it was probably carried by humans or livestock into South America and is not native there. The species is also reported from the literature from Cuba, and Peru. It is invasive and has spread extensively outside its native range in many other countries. Altitude range: It grows at elevations of 100 to 2,300 metres above sea level. Habitat and ecology: Cylindropuntia tunicata grows in the Chihuahuan Desert in xerophyllous shrublands on sandy to gravelly substrates, usually calcareous slopes or alluvium. It is widespread and common, and can be a noxious weed. This species is spread widely by attaching to livestock fur and thus the original range is difficult to define. In its native home O. tunicata often takes on abnormal shapes, for the joints, which break off easily and many small dwarf plants are found everywhere about the larger plants. Small plants of Cylindropuntia tunicata arising from fallen fruits or seeds consist of series of subspheric segments resembling club-chollas (Opuntia clavata); those have been named Opuntia stapeliae. Apparently in some areas, few of these make it to maturity and larger young plants are rarely seen. 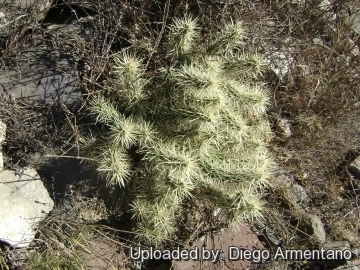 Description: Cylindropuntia tunicata is a very variable densely branched shrub, sometimes low and spreading from the base and forming broad clumps, at other times 50-60 cm high, with a more or less definite woody stem and numerous lateral branches. It has many sharp spines at each areole nearly obscuring stems. Trunk: Cylindrical fleshy, usually very short (if any), becoming woody as it ages, strongly armed with thorns. Stem segments: Pale green to green, easily detached, whorled or subwhorled, sometimes short and nearly globular to narrowly oblong, 5-25 cm long, 1.5-2.5 cm in diameter, with very prominent broad tubercles 2-3 cm. Areoles: With yellow to tan wool, ageing grey, triangular approx 4.5-8 × 2.5-5 mm. Glochids: Pale yellow, in small adaxial tuft, 0.5-1.2 mm long. Spines: 5-12, on most areoles, obscuring the stems, needle-like, spreading, larger ones 3-6 cm long and 2-4 mm in diameter; sheaths very loose fitting. Yellow to reddish covered with thin, white, yellow to tan persistent papery sheaths. Flowers: Yellow to yellowish green, to 3 cm long and in diameter. Inner tepals yellow to yellow-green, spatulate, obtuse 15-20 mm, apiculate. Filaments yellowish. Anthers yellow. Style green to reddish. stigma lobes yellow-green to green. Ovary often bearing long spines at the areoles, but usually naked. Blooming season: Flowering late spring. Fruits: Top shaped to club shaped, 25-50 mm long, 8-15 mm in diameter, yellow to yellow-green, often tinged red, mostly sterile, not proliferating, pulpy, usually spineless or sometimes weakly spined, tubercles evident subequal. Umbilicus 5-7 mm deep. Areoles 32-40. Seeds: Obovate, approx to 2.5 × 2 mm; girdle smooth, light tan coloured. Chromosome number: 2n = 22. 4) Ulises Guzmán, Salvador Arias, Patricia Dávila, “Catálogo de cactáceas mexicanas” Universidad Nacional Autónoma de México, Mexico 2003, p.114. 6) Arreola, H., Bárcenas Luna, R., Cházaro, M., Corral-Díaz, R., Goettsch, B.K., Heil, K., Guadalupe Martínez, J., Sánchez , E., Terrazas, T. & Terry, M. 2013. Cylindropuntia tunicata. “The IUCN Red List of Threatened Species.” Version 2014.2. <www.iucnredlist.org>. Downloaded on 27 July 2014. 9) Rauh, W. 1958. “Beitrag zur Kenntnis der peruanischen Kakteenvegetation.” Stizungsber. Heidelberger Akad. Wiss., Math.-Naturwiss. Kl. 1–542. Cultivation and Propagation: Cylindropuntia tunicata is a a much decorative hardy cactus easily found in cultivation. It is a summer grower species that offers no cultivation difficulties. 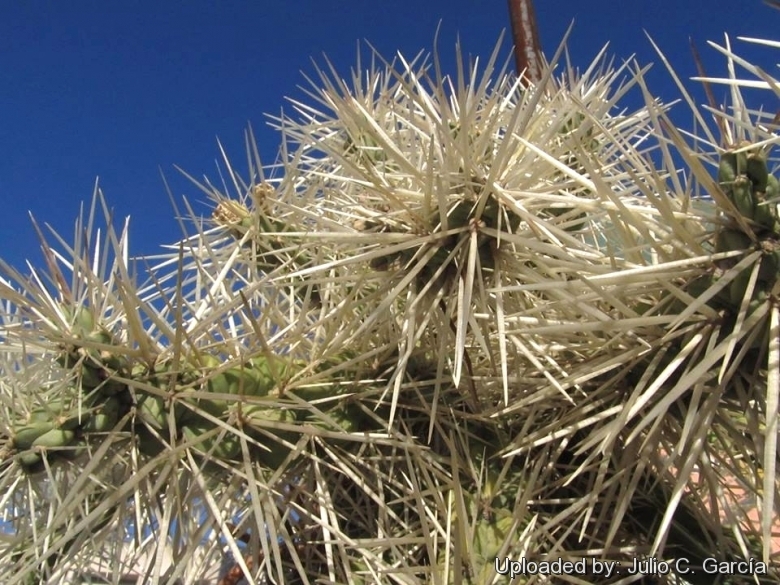 Its cylindrical densely spiny joints provide a striking accent for an otherwise dormant cactus garden. Hardiness: It is a quite frost resistant cactus, hardy to -7° C (- 12° C or less if very dry). However in cultivation it is better not to expose it to temperatures lower than -0° C, even if in an aerated and protected location, in order to avoid the formation of anti-aesthetic spots on the epidermis. In presence of high atmospheric humidity avoid any frost as it is particularly sensitive to root rot. USDA Zone 7-10. It can handle extremely high temperatures in summer. Use: It is suitable for “desert” gardens, in association with other xerophytes. Where the open air cultivation is not possible due to the climate, it is to be cultivated in pot in order to shelter it in winter. Other uses: Uses: Hawaiians use the stem and root juice for constipation and to help expectant mothers. Cylindropuntia tunicata is also used to make impenetrable hedges round plantations and such fences are often seen in Mexico and in several South American countries. 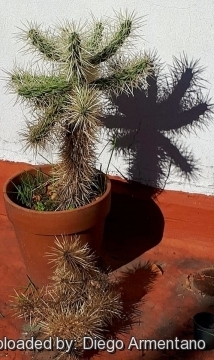 Warning: It is armed with treacherous spines that are extremely sharp (This is one of the most dangerous of all cactus). Handle it with extreme caution, and keep it away from gangways and areas frequented by children and animals. Spines must be meticulously removed with tweezers. Propagation: Propagation: scarified seeds, stem division. Prickly pear pads root easily and grow rapidly when placed in loose, well-draining soil.